titles, the complete titles are too long for the display. Select this button to scroll the title. 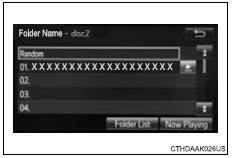 Turn the “tune•scroll” knob to move the cursor box to select a desired item from the list, and press the knob to play it. The track that is being played is highlighted. 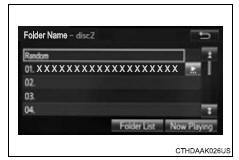 Press the “seek >” button or “< track” button, or turn the “tune•scroll” knob to select the desired track/file/song number. To fast-forward or reverse, press and hold the “seek >” button or “< track” button.